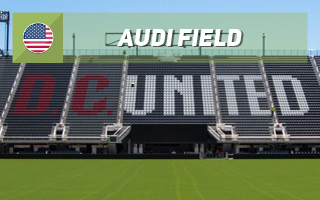 We're just minutes after the opening of Audi Field as we're writing this. The game against Vancouver Whitecaps ended 3:1 on the pitch and had a noticable debut on American soil by Wayne Rooney himself. But off the field it was far from extatic. Sure, we only watched it on TV, but so we did in previous seasons, when we were enjoying the atmosphere generated at the far less atmospheric RFK Stadium, with the noticable latino touch. On Saturday evening there was something missing. That something was quite loudly represented outside the stadium, where hundreds of supporters from the renowned Barra Brava and District Ultras protested against being excluded from D.C. United's organised group policy. It means only one group, the Screaming Eagles, can benefit from ticket allocation that allows resale in order to finance tifos and other displays in the stands. Some members of the excluded groups did attend the game, but refrained from organised support. And that's a real glitch in what was advertised as a night of #UnitedAtHome. 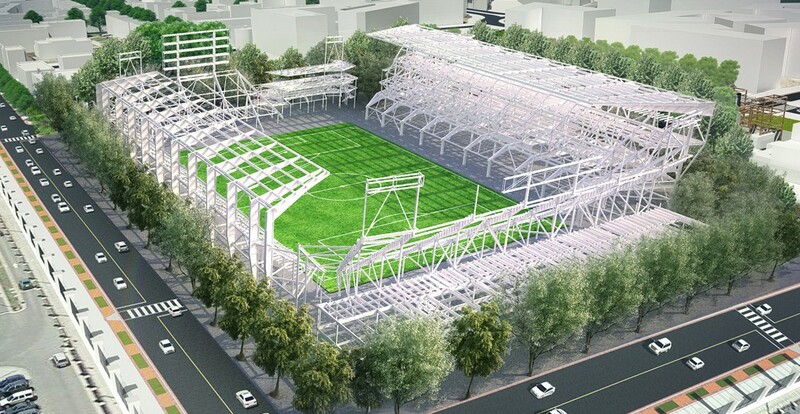 Instead another hashtag gained traction online: #StadiumForAll. And we're mentioning social issues in the first place (unlike our usual new stadium articles when we focus on stadium architecture and other features) for a reason. After all, one of the key goals in this stadium project was enhancement of the atmosphere. 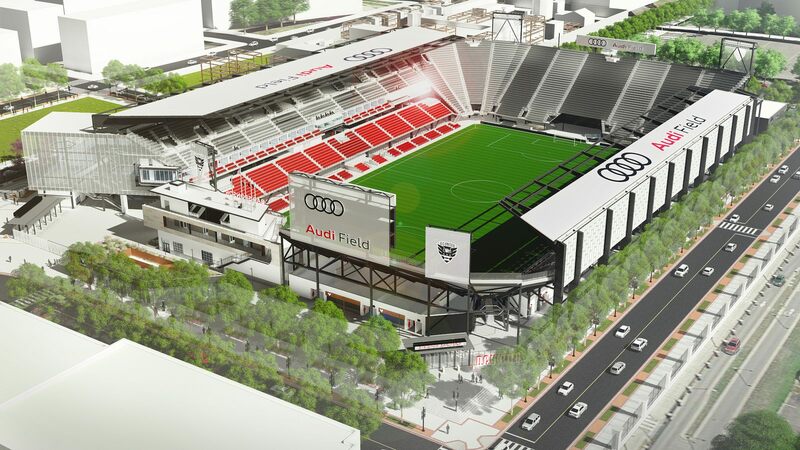 Please don't repeat mistakes of many European teams, D.C. United, because there are clubs (even architects and consultants, sadly) who thought a stadium itself enhances atmosphere. No, it does not. If you sanitise the crowd, even the steepest stands and best acoustics will be worthless. By the looks of it, everyone around United is interested in making it work. If that happens, this can be a true stronghold in American league football. OK, sermon over. 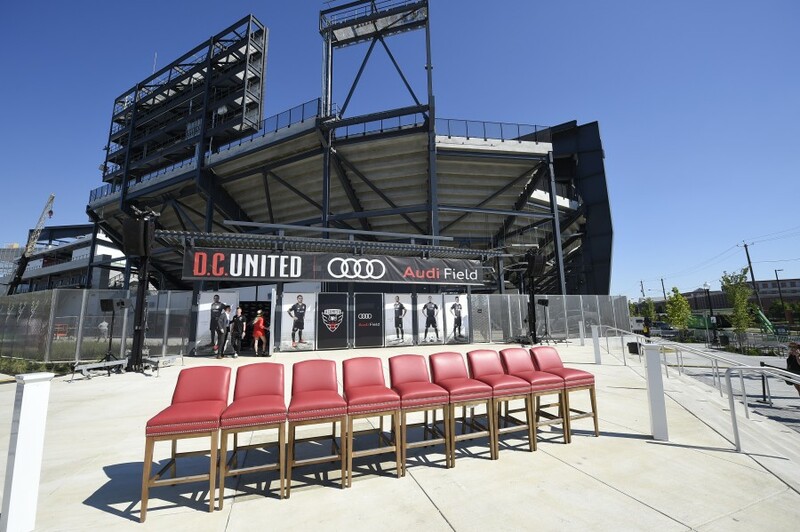 A football-specific stadium was the dream of D.C. United basically since the team's establishment in 1996, even if first expressed openly in 2004. By 2006 the first plan was drawn but then for almost a decade efforts were futile. This meant playing what proved to be 22 seasons at the iconic RFK Stadium. Iconic it may be, but not a football stadium by any measure. From the circular footprint to temporary stands beside the field bouncing along with the rowdy fans. Finally, the dream came to fruition with a site at Buzzard Point, an impoverished district south of the Capitol, where Anacostia meets Potomac. 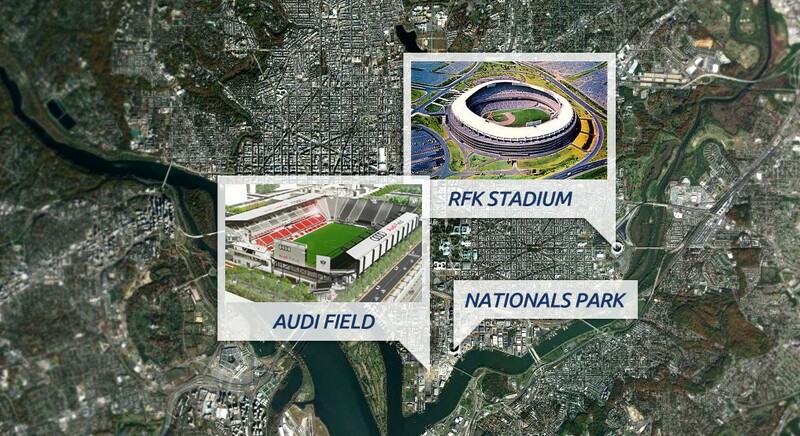 The stadium lot is, coincidentally, just 350 meters away from a much larger venue, Nationals Park, both connected by Potomac Avenue. Though we're talking of a private project, there was quite some investment required from Washington D.C. as well. The municipality had to acquire land worth some $100 million, including clearing works. It didn't go without controversy as some of the funds came from education expenditure, already deemed insufficient. Contrary to many other countries, however, public authorities did not pay for the stadium construction itself, valued just below $200 million. Along the scheme the stadium was built privately, then taken over by authorities and leased to D.C. United, who are now bound to use it in their MLS campaigns. Architecturally it also proved somewhat controversial. Back in 2016 it barely passed evaluation by the zoning commission and was described as not satisfying. Ironically, it was much smoother in renderings than reality, despite hopes of the commission being the opposite. Is that a disadvantage, though? While largely left bare, the structure utilises its 5,500 tons of steel and bare concrete as part of the rough appeal. There's also little room for decoration left, at least on three sides of the building. The key task before Populous and their partners at Marshall Moya Design was fitting a 20,000+ auditorium into one of the tightest plots in US football, under 4 hectares (430,000 square feet). In order to cram that many people safely inside, the stands are largely raised above ground, seeing catering and sanitary facilities pushed beneath to give crowd circulation space on ground level. Spacious and airy concourses shelter fans under the auditorium. While challenging, this proved an opportunity to deliver a very robust and vibrant place, possibly even intimidating to travelling teams. At its closest point, the field is just 2.5 meters (!) away from spectators, far below FIFA recommendations. Three of four sides are also very steep at 35º, almost as high rake as can be safely delivered. With 30 rows in the northern supporter area and 35 rows in the south this gives great opportunity to create a boiling cauldron of chants indeed. Unlike vast majority of modern stadia, this one has its main stand in the east due to the amount of space available on that side. Here there are 4 levels of facilities, largely dedicated to hospitality. With 31 private boxes, 2 large suites and 1,500 business seats (+550 ground level seats) it's not the most 'corporate' stadium in MLS, by far. 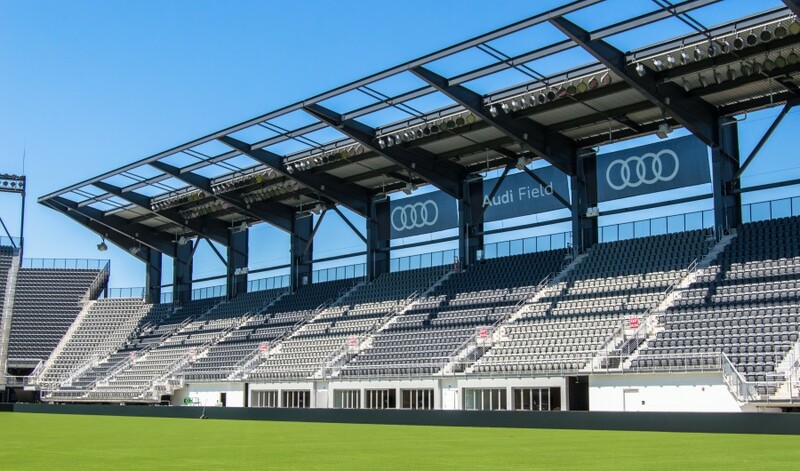 It's precisely the business seats that are closest to the field, though the goalkeepers can also feel fans breath on their backs, especially in the north, where 1,500 bleachers were installed instead of seats. One more irregularity in the stadium's layout is the north-eastern opening, which allows fans to almost glance at the field, while welcoming them from Potomac Avenue long before they reach the gates. To add difficulty to the stadium design process, it was also hoped to get the LEED Gold certificate for sustainability. From LED lighting, through photovoltaic panels covering the main stand's roof or rainwater retention for regular use, the stadium reached its goal. Among efforts to make it more 'green' fans are encouraged to take a 'European' approach and leave their cars home, using public transport or bicycles, for which a significant number of valet places are provided. Though site clearing had begun back in 2016, official groundbreaking proceeded in February, 2017. Since then Turner Construction, with 400 workers on site at peak, needed just over 500 days to deliver a fully functional stadium, opened in July, 2018. While only the football use officially began on Saturday, there will be much more going on. Almost 2,000 m2 was created for street-level commercial activity and there's much more room for new buildings to grow around the stadium in the future.